Peterborough United have re-signed West Ham midfielder Martin Samuelsen on loan. The West Ham midfielder will play for Posh until the end of the season and goes straight into the squad for the trip to promotion contenders Scunthorpe United on Monday. Samuelsen has also been given permission to play in the FA Cup by West Ham. The 19-year-old - whose season-long loan at Blackburn Rovers was terminated in November - played for Posh on loan last season. 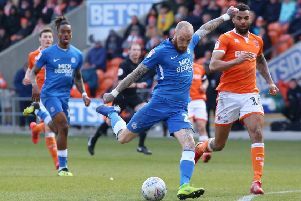 Posh boss Grant McCann Manager said: "It is great to have Martin back at the club. He is well loved by the players and the staff and of course the supporters, I am sure he will bring a lot more quality to us and we are looking forward to working with him again." McCann also confirmed that Tottenham Hotspur loanee Nathan Oduwa has returned to his parent club.